VW Chattanooga plant boss Frank Fischer. 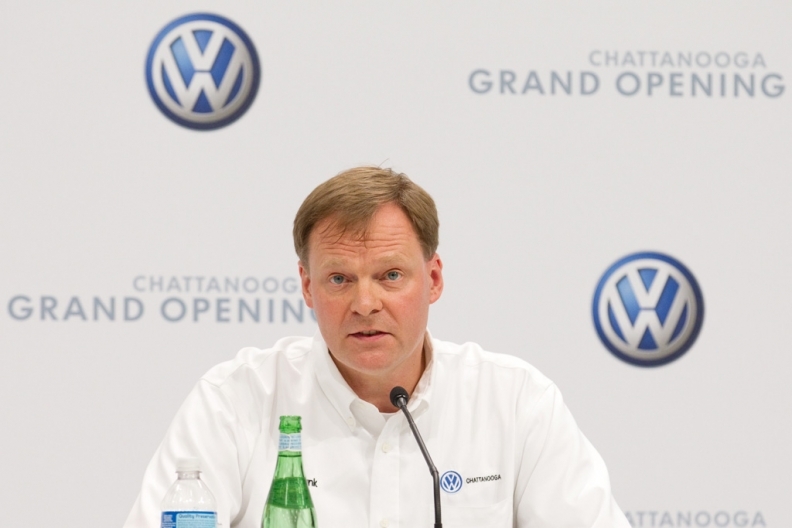 CHATTANOOGA -- Volkswagen opened its new U.S. factory last week. Plant boss Frank Fischer explained how the factory will boost local sourcing and how it aims to meet VW quality standards. Fischer has been in charge of VW's Chattanooga plant project in Tennessee since it began in 2008. He spoke with Automotive News Europe's sister publication Automobilwoche at the plant's opening ceremony. VW tried without luck to establish a U.S. presence with a factory in Pennsylvania. What are you doing differently this time? This time, we have a product that has the Volkswagen gene but is absolutely tailored to American customers. Furthermore, at that time, we bought a ready-made factory. So we were constrained. In our factory here, we were able to integrate all the experience from our 61 factories to date, including in Russia and India. And we have a whole range of American employees whose experience at other manufacturers here in the U.S. has had an impact, too. From a number of parts, we created a whole here in Chattanooga. What sets this factory apart? It is a factory where all the departments are easily accessible and they are able to react quickly to things. As a factory manager, I have always wanted that. The target was to source 85 percent of all parts locally in dollars. Currently we source about 90 percent of all parts in dollars -- that means independence from currency fluctuations. In addition, we have our own tool-production crew on site. They were involved in the development of the tools for sheet metal and plastic parts. So, in this way, we always achieve top quality with our tools. Are you breaking new ground in the selection of your employees? Yes. We were able to concentrate purely on the capabilities of new employees. Our assessment center contributed a great deal to this. At Chattanooga, there were no government preconditions, such as requirements to hire long-term unemployed. In addition, no applicant was hired unless the individual had spoken with someone in management. What have you changed compared to other VW factories? From the vantage point of the entire group, the assembly sections have a rare proximity to one another – simply as a result of their arrangement. The output points for the paint shop, body shop and assembly are just 100 meters from each other. In addition, we built a maintenance facility between the body and assembly departments in the middle of the factory. And the point where manufacturing hands over the vehicle to sales and distribution, known internally as counting point 8, is right by our work stations. Is VW setting new standards for their employees' own quality control? Employees here are themselves responsible for their work process and for their adherence to standards. With the training program Passion for Detail, we try to bring various cultures together into an overall plant culture. That way, the VW gene is present in production, too. Are your U.S. employees excited about the new Passat? Naturally. That's the reason why driving the car is part of our training program.